Today’s the shortest day of the year, so it may seem churlish to spend it complaining about light. But don’t get me wrong – it’s not sunlight I have a problem with. I can vaguely remember what it’s like, and I’m keen to renew the acquaintance. It’s light pollution that I want to talk about today. It’s obvious how water pollution can harm wildlife – the dramatic decline of the otter in the mid 20th century is a well known example. And we’re hearing more about the health effects air pollution has for humans (and presumably wildlife are affected too). But there’s less awareness of the problem of light pollution. Last week there was a story on the BBC website about how robins’ behaviour is affected by light pollution. 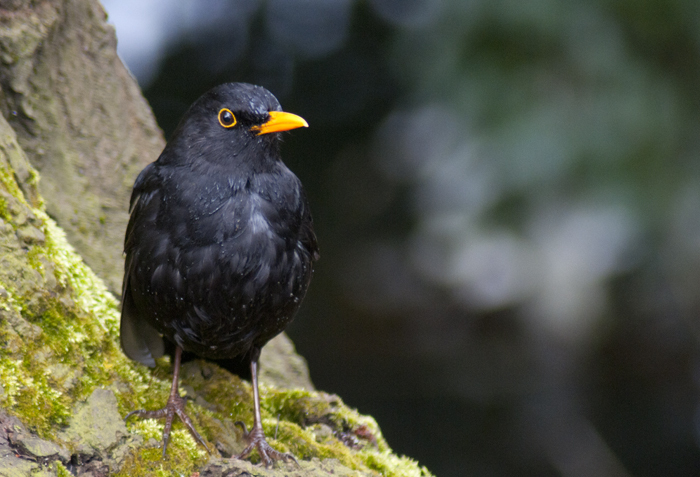 A study by Southampton University found that robins that lived closer to lit paths and noisy roads were much lower down this dominance hierarchy – the birds in these territories displayed less aggressively. Robins aren’t the only creatures affected by light pollution. Other birds, reptiles, amphibians, moths and bats are also affected negatively. But some species can adapt to make the most of it, like the common redshank, getting longer to feed because of artificial lights. Another disadvantage of light pollution is that it stops us seeing so many stars. Where I live, in a street-lit town, I’m never going to see the Milky Way. On holidays to more remote, darker places, the stars at night take my breath away. Light pollution is a subject that’s too close to home for me. My bedroom overlooks a recently refurbished office building that’s floodlit throughout the night, meaning that, despite the blackout lining of my curtains, my bedroom never properly gets dark. In some places things are being done to reduce light pollution. The funding cuts for councils means many are now looking to save money (and reduce carbon emissions) by turning off street lighting in residential roads late at night. 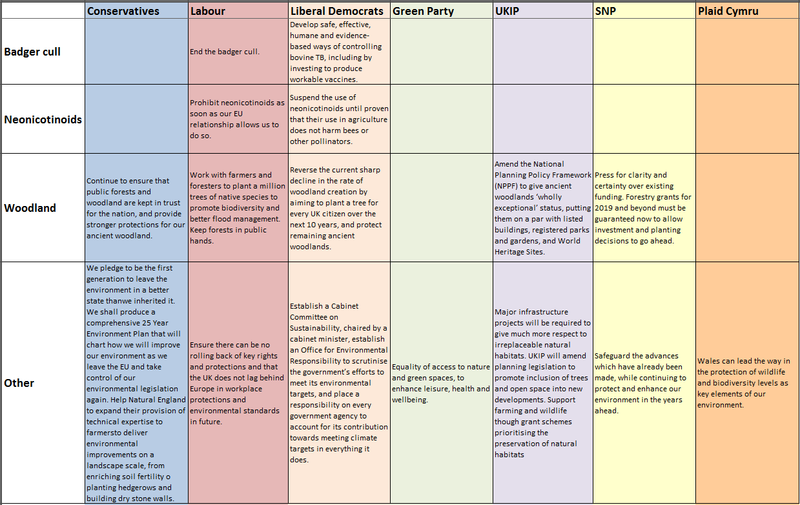 In fact, my council are introducing this to the town I live in next month. My road is a major traffic route, so the lights will stay on. But other, quieter roads, will have their lights turned off between midnight and 5am in the morning. Hopefully this will benefit at least some of the local wildlife and residents. As for me, I’m looking forward to a trip west, where night will be dark, and, if the skies are clear, I’ll be able to see the Milky Way. and some new ideas below. parent bird feeders stick to your window, giving good views of whatever’s taking the food. 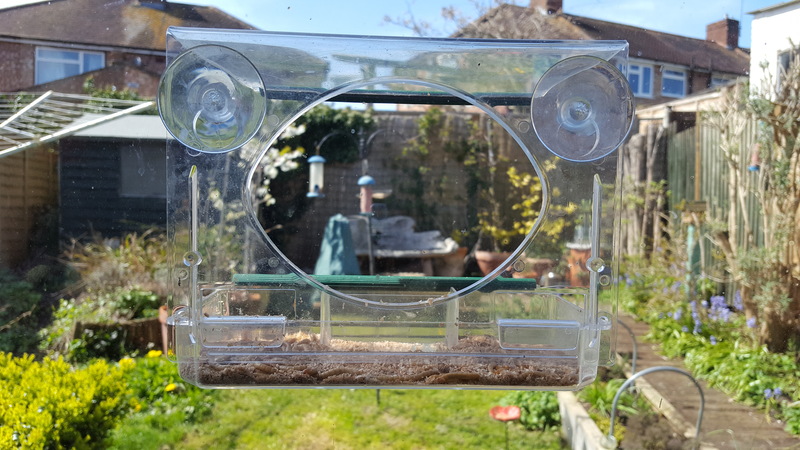 We’ve had one for years, but never really used it until this year, when we started feeding live meal worms during spring. The robins loved it, and we got plenty of good views from the comfort of our own dining room. 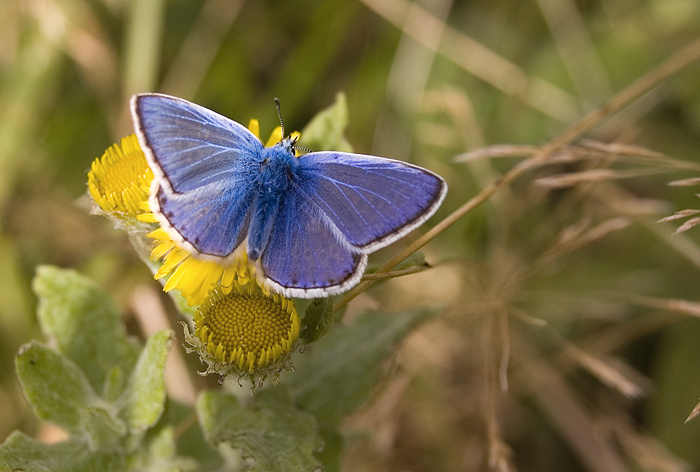 You can get them from various places, including the RSPB. If the person you’re shopping for isn’t too squeamish, you could even get them some mealworms to go in it. 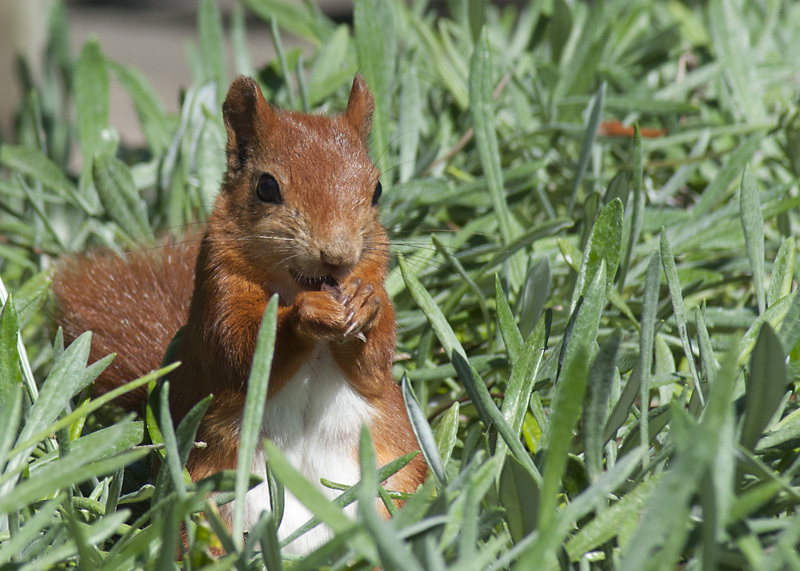 They’re ugly, but just about every bird and mammal that visits our garden loves them. Wildlife-related clothing: this one’s probably found its way near to the top of the list today as it’s so darned cold. I’ve got my eye on a badger jumper to keep the chill away. PTES have some good designs, as do Sussex Wildlife Trust. 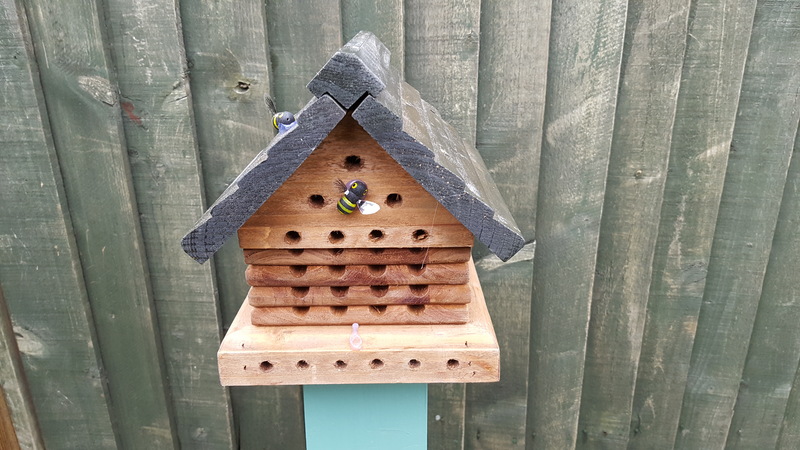 Solitary bee house: bees of all sorts have had a tough time over the last few decades, but they’re essential pollinators, so we need to help them out. We were given one last Christmas and have really enjoyed seeing the leafcutter bees make use of it. The charity BugLife have a selection. As do NHBS. A wildlife calendar: I’m a bit biased, as I sell calendars of my wildlife photography to raise money for charity, but I think calendars make great presents (as long as the person you’re buying for doesn’t have too many already). Mine have pretty much sold out this year, but there’s plenty of thers out there. Wildlife Photographer of the Year always produce great ones. The RSPB has a good choice as do WWF and the Wildlife Trusts calendar looks super. A good thermos: I’ve come to hot drinks quite late in life – I still don’t like coffee or normal tea. But having a flask of steaming hot drink to warm you up on a cold walk or wildlife survey (or football match) can really make a difference. Some are better than others – look at the details on how long it will keep a drink warm for before you buy. 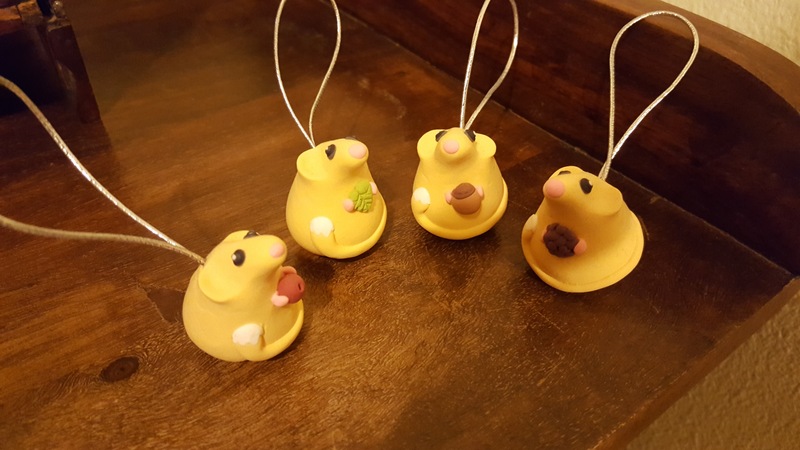 Something beautiful and handmade: One of the members of the dormouse group I’m part of makes fantastic wildlife-related ornaments, jewelry and decorations. I fell in love with her dormouse Christmas tree decorations, but she does wonderful birds, butterflies and other mammals as well. Books: Books are always on my list. Check out what natural history books your local bookshop has to offer. I quite fancy ‘That Natural Navigator’ by Tristan Gooley, as I like the thought of being able to navigate without a smart phone or GPS. A sea safari: In Britain nowhere is that far from the sea, which holds some of our most exciting wildlife. A holiday is not complete for me if it doesn’t include a boat trip, and you can’t beat the thrill of seeing dolphins race and play, or the leisurely trawling of a basking shark. Look out for your local operator, but make sure they’re members of the WISE scheme (which means they’re accredited to run their trips in a way that’s safe for wildlife). Dr C still hasn’t booked me on a whale watching cruise of the Bay of Biscay yet (see 2014’s post), but maybe I can persuade him to let me go for a day trip at least. Wildlife Gardening Information Pack: This was part of my prize for winning the small private garden category of the 2015 Surrey Wildlife Garden Awards, and I’ve found it packed full of ideas – highly recommended! Go into any shop these days and you’ll see that Christmas is sneaking up on us. Last year I posted my Top 10 Christmas Present Ideas for Wildlife Enthusiasts. Since I’m sure you went out and bought all of my suggestions, here’s a few more ideas for this year (hint, hint, Dr C! ), ranging from £3 to as much as you want to spend. Extension tubes for macro photography: Some of our most fascinating, beautiful and weird-looking wildlife is pretty small. The best way to photograph it is with a macro lens, but these cost hundreds of pounds. 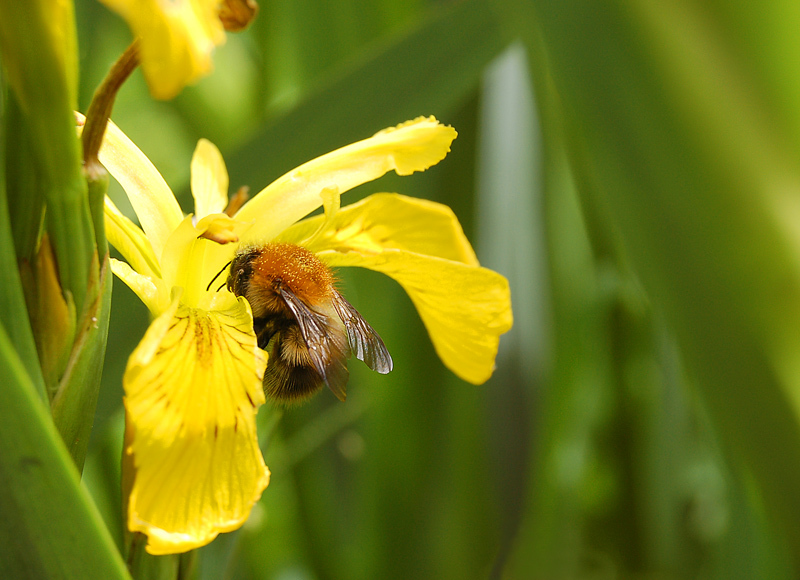 Extension tubes are a cheaper way of taking macro photographs, ranging in price from around £30-150. You fit them between your camera and your lens. I’ve never used them, so can’t provide advice on which ones to go for, but they’re on my Christmas list. Bat detector: I’ve had lots of fun this year trying out my bat detector. It opens up a whole new sonic world. I also have to admit I’ve had a bit of frustration as well, not being able to distinguish between some bat species. A basic heterodyne model like mine will set you back around £60, but you can get fancy ones with software that will help you tell which bats you’ve found if you’re willing to spend a bit more. 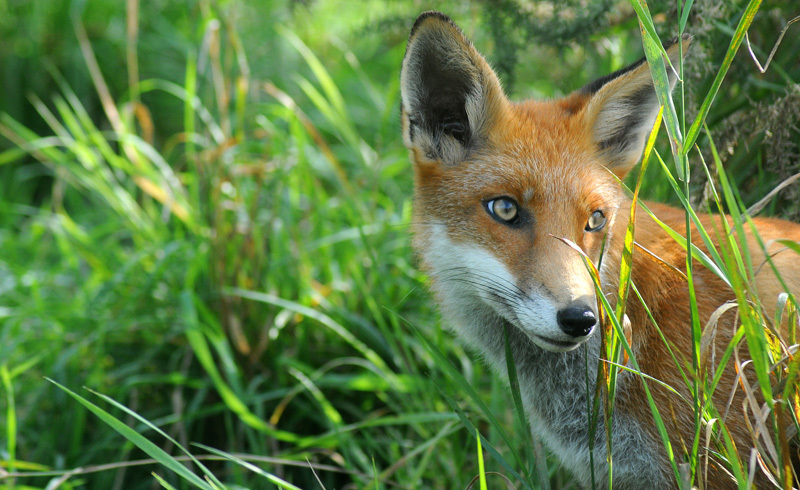 Wildlife courses: I love learning more about wildlife, so a place on a course run by the Mammal Society, local wildlife trusts, Field Studies Council etc. would be a great present. There are so many to choose from. I quite fancy one of the Field Studies Council courses on Bushcraft. I could also benefit from learning a bit more about identifying bats (see previous suggestion). Go Pro Hero camera: Go Pro cameras have a reputation for robustness and portability. They make waterproof, dustproof cameras that can be mounted on headbands, helmets, harnesses or bikes. I’m hoping to go snorkelling with seals next year, so would love to be able to take some better quality photos than with the disposable waterproof camera I used last time. The Hero is their basic model, and you can get it from around £100. Field guides: The Field Studies Council produce an excellent range of laminated guides to help you identify different types of animals and plants. These can be carried easily (unlike a book), and you don’t need to worry about getting them wet. Most of them cost around £3, and there’s a huge range to choose from. Wildlife art: a thing of beauty is a joy for ever. 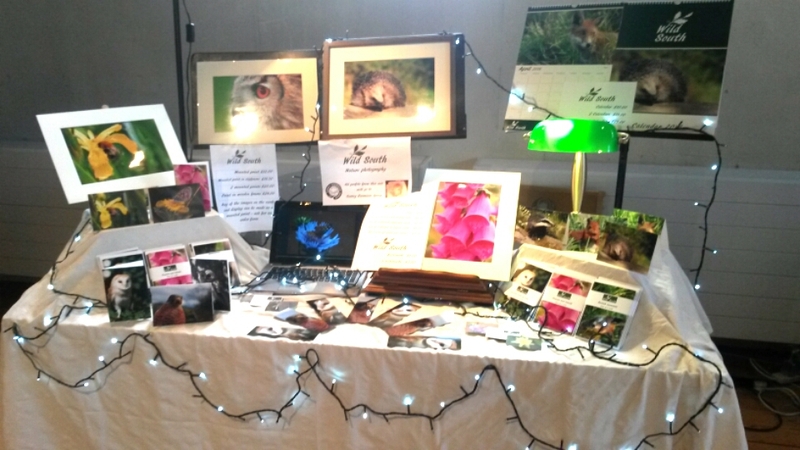 Why not buy your loved one a piece of art featuring their favourite wildlife? It needn’t cost a fortune – if you’re a photographer, enlargements can be very reasonable, and if you mount it yourself the end result can look good at little cost. If you’ve got a bit more budget, there’s a huge amount of choice. I’m very pleased with the barn owl sculpture we recently bought. The National Trust gift shops have some beautiful bronze otters and hares – I’ve been dropping hints about the otters for several years. Jean Haines’ watercolours are stuningly beautiful as well. Books: as an otter fan, Otters of the World is on my Christmas list. I am also intrigued by The Hunt for the Golden Mole. The Bird Atlas is pricey, but could make a keen ornithologist’s Christmas. And Wildlife Photographer of the Year have published a 50th anniversary book. Whale-watching cruise: if you feel like pushing the boat out, why not treat your loved one to a mini dolphin and whale spotting cruise round the Bay of Biscay? Birdy plates & glasses: I’m rather a fan of these birdy plates, mugs, glasses and other homeware. I think they brighten up breakfast on a dull winter’s morning. Binoculars: a good pair of binoculars really helps with wildlife watching. Compact pairs can be surprisingly good, and easier to carry around. More good news – both house sparrow chicks have now fledged. The last couple of days they’ve looked like proper sparrows, rather than merely cavernous beaks. There’s been lots of wing stretching and peering out of the hole. The first chick fledged on Monday morning. The other chick seemed a bit reluctant to leave the nest. She waited until Tuesday morning, spending quite a bit of time peering out the hole, then hiding at the back of the nest before finally summoning up the courage… The parents didn’t waste much time after the chicks had left, before coming in to get it ready for the next brood. This video shows the two chicks together in the nest, just before they fledged. It then goes to show the second chick fledging on Tuesday. Finally there’s a bit of the daddy doing some housework once the chicks had left. House sparrows can have several broods each year, so hopefully we may get to see some more. Soon after we moved into our house we built a mini pond, made of a wine barrel. I was delighted when, a few weeks later, we spotted frogs in the pond and around the garden. But then winter came. I don’t know if you remember, but the winter of 2010 was a particularly cold one (as was 2011 and 2012). Since that winter we haven’t seen any frogs in our garden. I don’t know if it’s connected, but I wouldn’t be surprised if the cold had had a bad effect on the frog population. I used the ‘Dragon finder’ app on my phone, developed by the charity Froglife, to identify what species the frog was (through answering a series of simple questions), and report the sighting, together with a photo and GPS location. It was very easy to use, and I’m looking forward to trying it out on some other amphibians and reptiles. It looks like at least one has returned to our garden. Let’s hope he’s the first of many! I’m ideally placed to see the six species of reptiles that are native to Britain, as all of them can be found in Surrey. 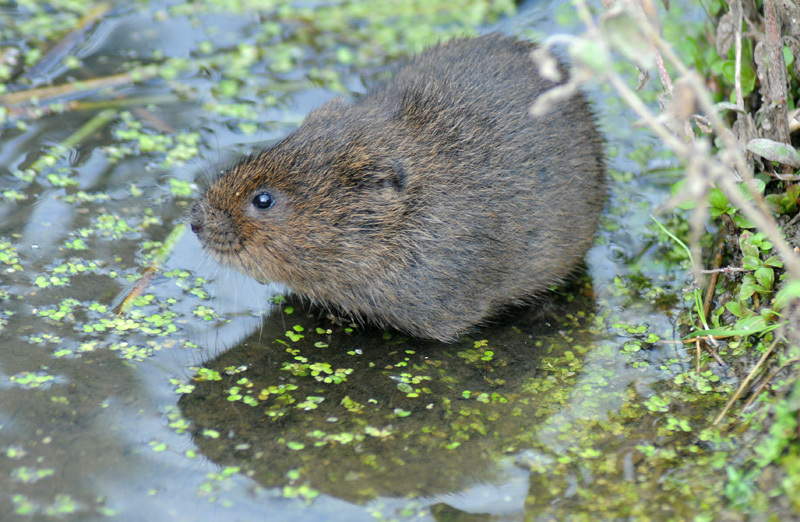 (I’ll have to go further afield to see some of the non-native ones that now live in the wild in Britain). So last week I joined Surrey Wildlife Trust rangers Jamel Guenioui and James Herd for a stroll around Rodborough Common to see what reptiles were out and about. 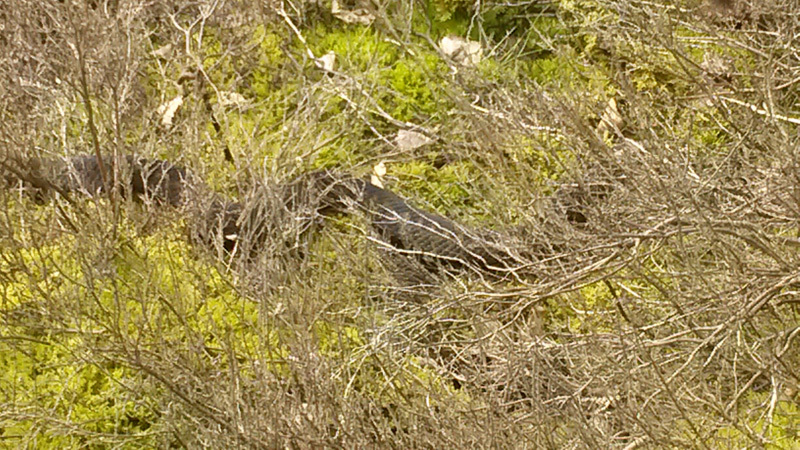 Rodborough Common is ideal reptile habitat, with heathland surrounded by woods. The only thing missing is waterside areas favoured by grass snakes. The weather wasn’t brilliant for reptile watching, as it was mostly overcast, and a cool 10 degrees when we set off. But it did brighten up and warm to 16 degrees by the end of the walk. We followed a transect of the common that is used by Surrey Amphibians and Reptiles Group in their regular surveys of the site, checking under sheets of corrugated tin and roofing felt left in strategic locations, and trying to spot creatures basking in the open as well. Despite the overcast conditions we did pretty well. 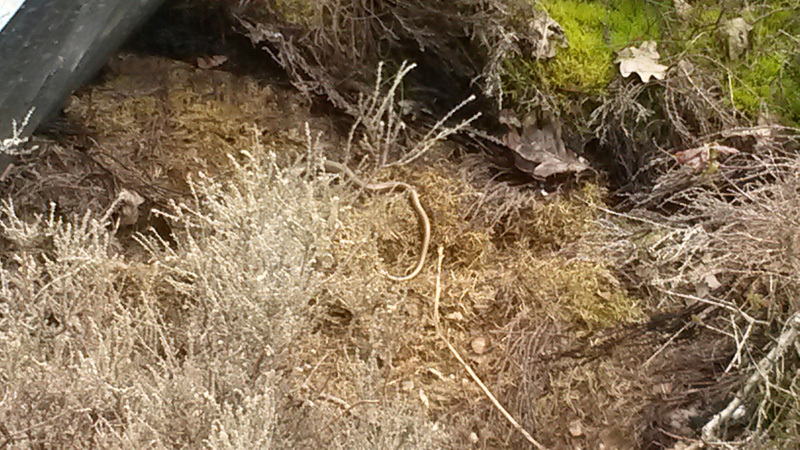 Quite a few of the refuga had slow worms underneath, and we spotted a few large adders basking in the open. 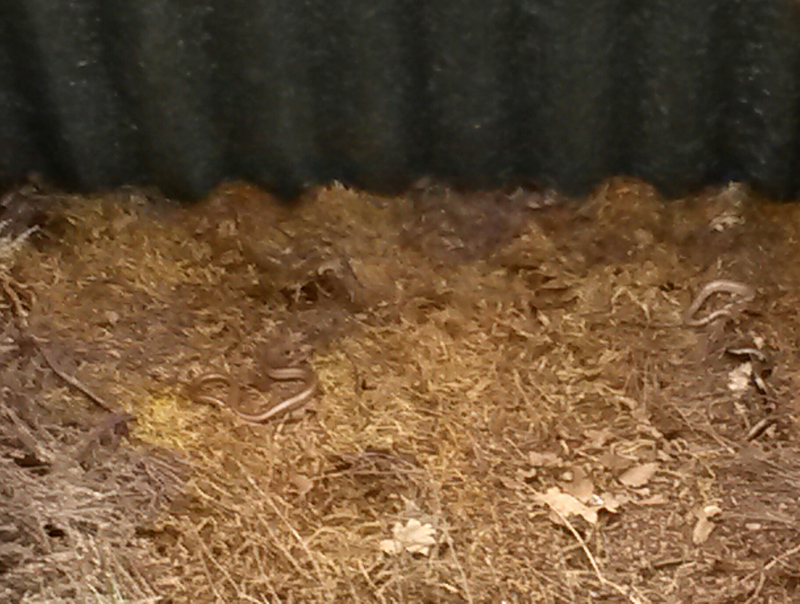 Reptiles aren’t the only creatures who enjoy the warmth of the refuga. A few had woodmice underneath, and a lot had been taken over by ants, particularly wood ants. It was good to see reptiles up close, and for longer than the usual fleeting glimpses I get. While I didn’t manage to tick any new species off my list, hopefully the practice of spotting them out in the open will help me to see more in the future. We also got to see roe deer roaming the common, and hear a cuckoo (a rare sound these days). It was a very informative and enjoyable way of spending the morning. 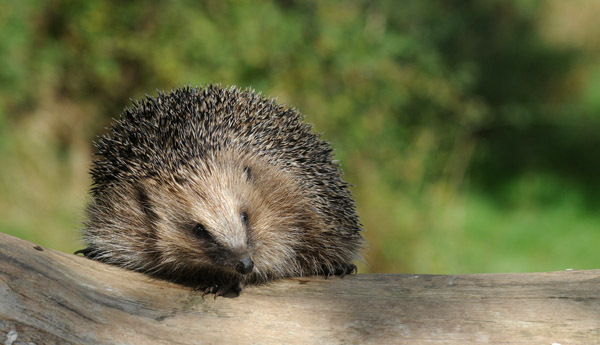 The walk was one of a series run by Surrey Wildlife Trust in various locations across the county. 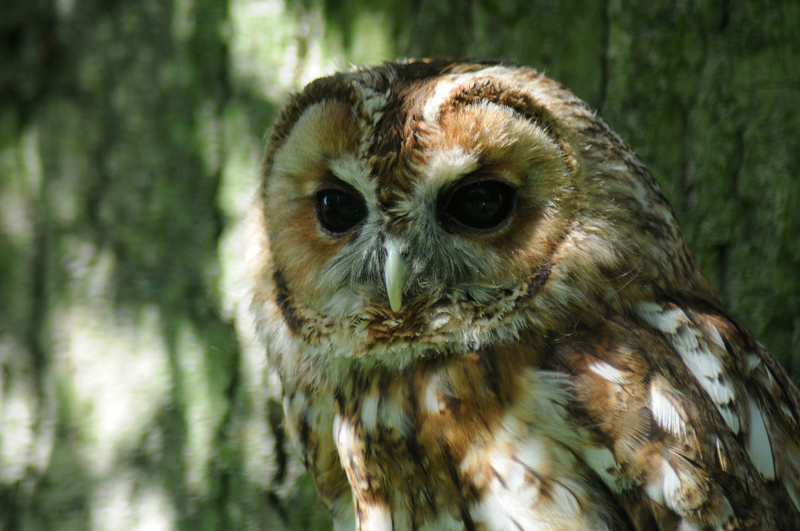 Their website has details of future walks, focusing on different sorts of wildlife. Badgering pays off at last! Good news – the government has finally decided to listen to the evidence and put a stop to plans to roll out the badger cull. My previous blog post on the evidence for and against the cull discusses this. Suffice it to say, the pilot culls failed miserably on the first two criteria. It’s only success was that no-one was hurt. Despite the overwhelming evidence on the failure of the pilot culls, the high costs and widespread public and political opposition to them, it was by no means certain that the government would pull the plug on the idea of rolling them out. The National Farmers Union have continued to push for them. But we now know they won’t be expanded to new areas. The government have also announced a programme of vaccinating badgers around the edges of areas with high levels of bovine TB. 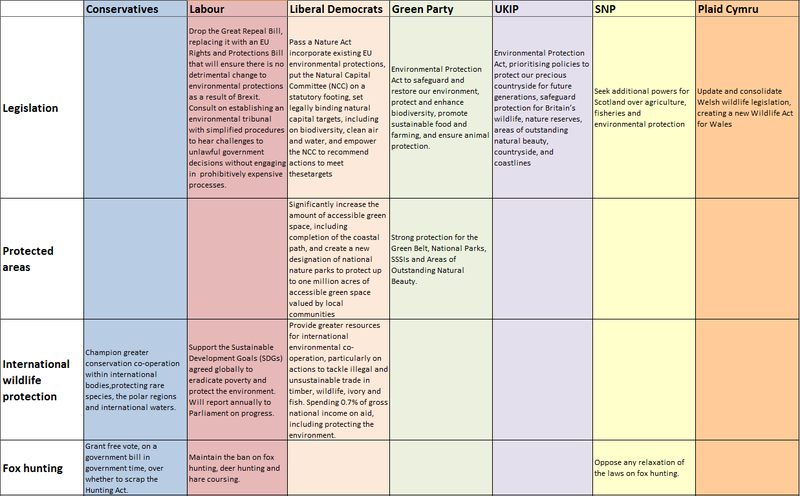 The culls have, from the start, been more about politics than evidence. 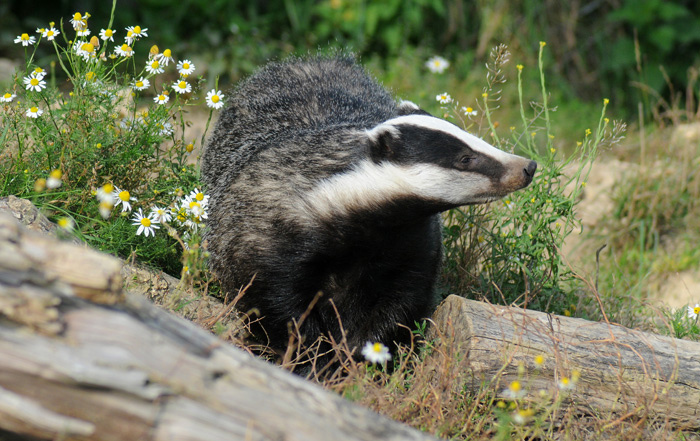 I have no doubt that the decision not to expand the cull is mainly due to the campaigns against it, rather than whether the cull was likely to reduce bovine TB. Well done to all who campaigned against the cull, and the activists who monitored the cull. 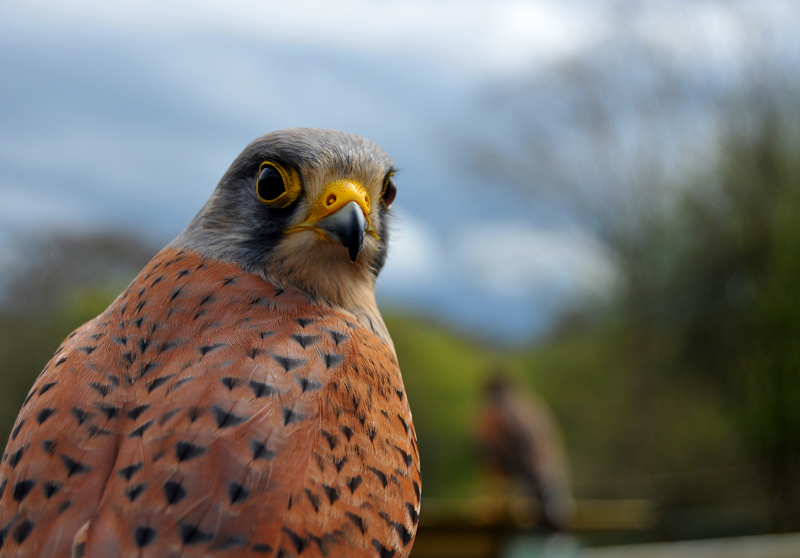 Last week the RSPB released the results of the 2014 Great British bird watch. Once again house sparrows topped the list, with an average of 3.8 seen per garden. The survey was carried out by almost half a million volunteers across the UK. It involved watching a garden or park for an hour during one weekend in January, and recording the maximum number of birds of each species seen at one time. So how do the results compare to the average number of birds I saw in my garden this January? The table below shows the mean number of birds observed per site in the UK as a whole, Surrey, and my garden. As you can see, the results are pretty similar. House sparrows also topped my list. Unlike the rest of Surrey and the UK, I didn’t see any goldfinches. Dunnocks did make it onto my list though. But how does this compare to previous years? 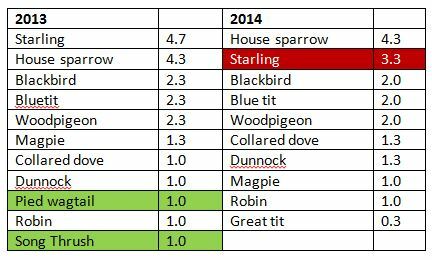 Compared to last year there has not been a huge amount of change in the average numbers of birds seen for the top 10 species nationally. For my garden, there has been a drop in the number of starlings, and smaller drops in the numbers of several other birds, but that may be down to the mild winter meaning birds don’t need to visit the feeders in my garden as much as last year.